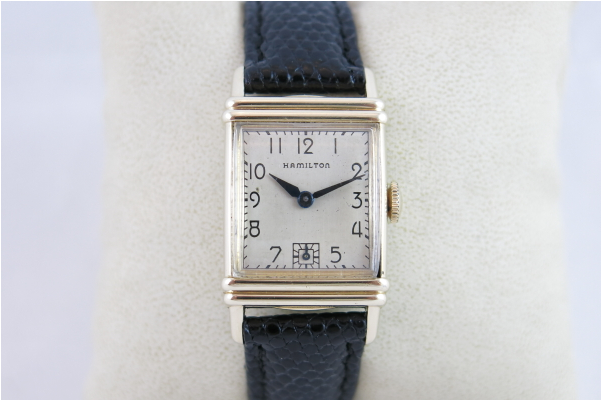 A lot of the watches Hamilton produced in 1941 were re-introduced after WWII ended. Some watches, like the coral gold models, were not reintroduced. In fact, I don't believe Hamilton ever made coral gold models again. Originally, the Lester came with two dial options - an AGN dial with solid 18K numerals or a black enamel numeral dial. Regardless of the dial choice, the case came in 14K yellow gold fill. Under the dial is the 14/0 sized, 19 jewel 982 movement. After 1940, the solid gold models got the 982M. 10K gold filled models got the 17 jewel 980 and the 14K gold filled got the 982 movement. The Lester is readily found but hard to find without at least a little bit of wear to the bezel corners where the lugs attach to the case. I recently picked up a black numeral dialed version and I was happy to get it. I think I've only seen a couple of other examples - ever. I'm not saying it's ultra-rare, but it was only produced in 1941 so there are loads more AGN versions out there. My black numeral dialed Lester came in an excellent case. The hour hand was a little loose and probably not original to the watch. It looks a little too big to my eye. I also have an AGN version. If you look closely you'll see a little of the typical wear through on the outside corners - but it's not too bad in comparison to many examples I've seen. 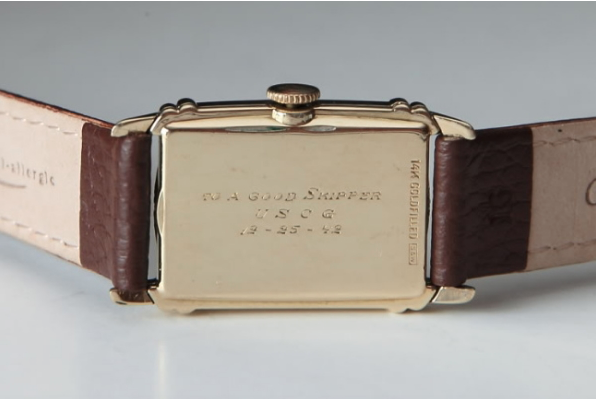 I really like the case, regardless of the wear through, because it's a Christmas watch with a nice engraving, "To A Good Skipper USCG 12-25-42". The wear through just shows you this was a treasured watch. As an "old Navy man" myself, the engraving touches a soft spot. After all, during a time of war, like in 1942, the Coast Guard falls under the Department of the Navy. The engravings on the back make them worth twice the price to me. But don't repeat that, please! I just found your blog. This is great. I am new to vintage watches and starting with Hamilton. Was Hamilton considered a step above Bulova and Waltham? I suppose the answer to that one is "it depends". Hamilton's movements were very highly regarded and they were largely US-made. Hamilton's cases were also a minimum of gold filled (until the 1950's anyway). Hamilton introduced Swiss movements in the 1950 to compete with the likes of Bulova, etc. at a lower price point. Bulova and and Waltham (et al) made some great watches too but I think if you compared the basic Hamilton models to basic Bulova or Waltham, then Hamilton had them beat. If you compared high end watches, an argument could be made but Hamilton probably still would win out. I am JP, an amateur horologist who has a keen interest in Hamilton pieces (being a Lancaster native, myself). I need to replace the crystal of my newly acquired 'Lester', but am having trouble locating a replacement crystal. Could you guide me to a replacement? I would like to try to put it on myself. Thank you so much for providing hours of reading entertainment and education with your blog. Hey JP, Your best bet for a replacement crystal is to look on eBay and contact a seller or two to see if they have one. 57Vert is one that comes to mind. Or email me and I'll give you some folks to contact directly. I don't post email addresses to my blog in order to protect them from spammers. Remember that glass crystals are held in place with UV glue and plastic are glued in with crystal cement. You can find a Lester crystal in glass or plastic - either is fine but I prefer glass. Thank you so very much! I have sent 57Vert a message and will eagerly await a reply. I really appreciate your help and advice. I went to my local watch repair man and asked him a few questions about my new friends (Lester, Lakeland and Lowell) I picked up on ebay, and he was less than helpful, even had some disdain for me trying to repair them as an amateur. So, that said, I just want to thank you again for your blog, your open and quick communication and you advise (which I am sure I will be seeking again). Being a professional watchmaker today is very difficult. On the one hand you have an industry trend where major watch manufacturers will ONLY sell parts to you if you've been "qualified" by them - which is very costly, very time consuming and very one-sided (toward the manufacturer). Imagine trying to make a living as an auto mechanic and only being able to buy parts if you owned a dealership? Then you have affluent, arrogant and uninformed consumers who paid a LOT of money for a high end watch and get angry when they find out it's also expensive to maintain - and they take it out on their local watchmaker. Then on the third hand, you have hobbyists (like me) who initially think, "this shouldn't be too hard" and innocently assume there's nothing to it. Only to get in way over their head and come looking to a pro to help them get it straightened out. So you can see why a lot of professional watchmakers are grumpy curmudgeons. I've grown to appreciate and respect people who have studied the craft under the watchful eye of trained instructors and had to demonstrate the ability to build their own watch completely from scratch in order to "pass" their formal coursework, I can understand why they might get a little offended when it's assumed to be "easy". I'm sure they also get tired of trying to repair what a hobbyist inadvertently botched up. As they say... you can't make chicken salad from chicken crap. I've met a fair number of professional watchmakers and they almost universally keep hobbyists at an arms length - meaning they don't entirely embrace hobbyists but they are often willing to talk shop and lend advice ... if you know what you're talking about. Most are good people once you break through the rough exterior. Of course, if a watchmaker treats you like crap, take your business elsewhere. I have a Lester with a black dial. However, I don't think the Lester was made with a black dial. I've accessed some catalogs off a web forum and don't see that option offered. I also think I read somewhere (possibly on one of your blog posts) that Hamilton didn't offer a black dial on any pre-WWII models. Can you shed light on this? The only pre-WWII dial that comes to mind that would have been black is the Dunkirk. I haven’t done a post on the model yet but it’s coming soon. The Lester was made after WWII as well but I don’t think a black dial was offered. I suspect your dial has been refinished at some point and I’m sure it looks sharp. It does look sharp. Gold case...black dial...gold numerals...black lizard skin strap. I have a chance to sell it for what I have in it. On one hand, I'm increasingly drawn to pieces that are what they were. On the other, it just looks sharp. Thanks for the information. You are an invaluable resource. I also love your Etsy shop. I purchased a pretty good Hamilton Reference Guide on AMZ. As you stated, the Dunkirk offered a dial with a black finish. That same year saw the release of the Otis which also offered a dial with a black finish. As per this reference book, those are the first two models offering such a dial finish. 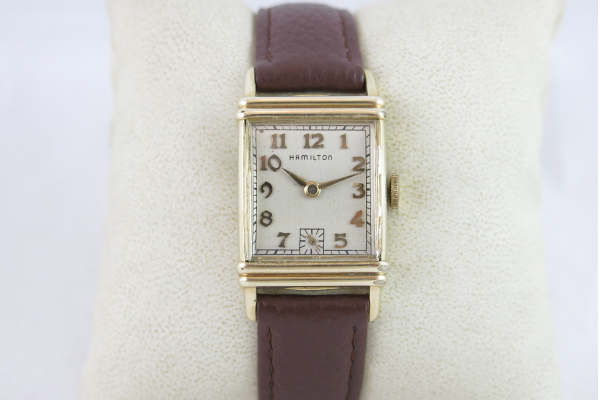 Then the same year as the Lester, Hamilton offered the Lexington which only had a stainless steel case offering but did have an option for a white or black finish on the dial. Aside from military watches, there wasn't a black finish offered again until '53. I forgot about the Lexington, that’s true. It doesn’t have a white dial (originally) although I’ve seen custom refinished dials and they look great. There’s also the Brandon from the late 40s. The Lester... I’m not so sure. It had a “black numeral dial” which was white with black printing. There is no black dial with applied gold numerals for the Lester (to my knowledge).